When it comes to the winter months for homeowners throughout Minnesota, you want to ensure that you’re thinking ahead when it comes to the beauty of your landscape. When spring finally gets here in the Minneapolis area, we’re going to want to get outside. You want to make the most of the warmer months around your yard, and a lot of people choose to use a pool to do just that. By adding a pool to your backyard, you’re able to enhance the look of your home as well as the option for relaxing and entertaining right at home. If you’ve already got a pool or spa, consider dressing it up to make your yard stand out a bit more. 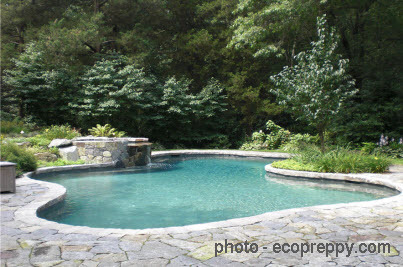 Having a pool can bring a bigger focal point into the landscape design picture. Think about adding walls around it or a decorative fence, and add to the excitement that is to come in the summer. Once you have a pool or spa put in your yard, it is time to think about what you’re going to put around it. Here are just a few ideas. You can add bushes, retaining walls, rock gardens, and so on to add to the beauty. You want to ensure that the look in your backyard is warm and inviting to your family and guests. Using brick to make walls around the pool provides a little color amongst the green grass and bushes you will put in around the pool, not to mention it adds more privacy to the area. Add small landscaping touches to the adjacent areas in your yard, such as stepping stones around your garden beds, patio, or deck to connect those spots to the pool areas. Smaller decorative rocks or boulders can add a bit more texture to the otherwise smooth-looking landscape around your pool. Bright bursts of colors around the area can come from either container plantings or garden beds of brightly-colored flowers. Having night-blooming flowers can add more to the scenery if you spend a decent amount of time around your pool in the evenings. Having a spot for an arrangement of patio furniture for a place to kick back and relax around the pool can also be something that is done to boost the appeal of the area. Your options are much wider than chaise lounges. Wood or stone benches set under nearby shrubs or trees can make a great spot to relax in the shade while enjoying the pool area. By adding these touches to the outside of your home, you will be able to see the difference that it makes. If you’ve got a pool that’s just sitting there all alone in your backyard, speak with the professionals at Architectural Landscape Design for further help when it comes to creating the most beautiful backyard pool landscape that you’ve ever created. We are experts at landscape design, but also a MN pool installation contractor throughout all areas of Minnesota and beyond. Call us today at 952-292-7717.